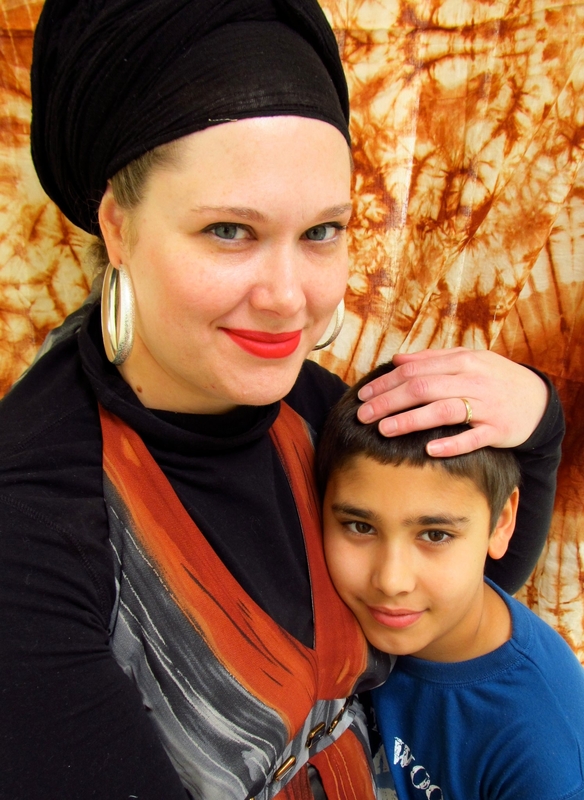 Deonna Kelli Sayed and her handsome son, Ibrahim. Deonna Kelli Sayed is an American-Muslim writer, author and cultural commentator. Today, the Karagoz puppet troupe and I are so very honored to share an essay written by our e-friend, Deonna Kelli Sayed. Deonna was kind enough to offer to write a guest post for me while my shoulder/writing capacity heals. I am very moved by this act of kindness and sharing but even more moved by her incredibly thoughtful critical consideration of what it can mean to be a transcultural or cross-cultural child in the United States of America – and a bit about what it can be like to be the Mom of that child (or in her case, the Farsi Nanna). I should mention that my M. (along with my internal puppet, Yehuda Rebbe, the wise man) was stopped in his tracks by her writing as I read it aloud to him last night – and immediately went to read more of her stuff. She’s a powerful writer! Although I have never met Deonna in person, I feel she is a kindred spirit and soul sister of some sort. Thank you so much, Deonna! Here is her bio: Deonna Kelli Sayed is an American-Muslim writer and author of Paranormal Obsession: America’s Fascination with Ghosts & Hauntings, Spooks & Spirits. She is also included in the New York Times featured anthology, Love, InshAllah: The Secret Love Lives of American-Muslim Women. Visit her at deonnakellisayed.com and her blog at deonnakellisayed.wordpress.com to learn more. She is also on Twitter @deonnakelli and Facebook at DeonnakSayed. I call on Yehuda Rebbe as my muse for this blog, for he is of the world and he is wise. And, Yehuda Rebbe is appropriate because my son’s name is Ibrahim, as in Abraham-Prophet-of-Monotheistic-Faiths. Plus, it is important to reveal at this moment – if the puppets will allow me – that Ibrahim’s nickname is “Hebrew.” I cannot tell you how, why, or when this particular nickname started. Nor can I suggest that it is wise calling a little brown, multiraced Muslim child “Hebrew” in public. It is not meant to offend. What such a name suggests is how complex and global a child is when he arises from multiple cultures, and his mother named him in hopes he would embody the best of all faith traditions. Odd little creatures emerge when spawned by and in-between the precious spaces of language, geography, and identity. Yehuda Rebbe nods in approval regarding my son, Ibrahim, being Hebrew by name. He also approves of complicated, culturally complex offspring. His nose wrinkles a bit when he reminds me that such children are the future of America — and also of the world. Ibrahim is an American-Afghan-Muslim boy aged ten years old. According to the US Census, he is Asian-American of mixed race heritage. His mother is an effervescently white American-Muslim (christened Methodist, raised Southern Baptist, Muslim long before marriage) who has lived around the world. His father is light wheat-colored man from Afghanistan who currently lives in Sudan. Ibrahim was born in Baku, Azerbaijan in an elite women’s hospital where the toilet tissue was the shade and texture of soft sandpaper. By the time he was six, he had more passport stamps than George Bush, Jr did when he took office. I mention skin hues not because they carry great philosophical importance, but because his mother, born and raised in racially segregated part of the rural South, has reared a boy who does not identify with America the same way she does. This is a good thing. Many of us are assigned our race and cultural status at birth, even if we do not agree with such labels. It is rare that we jump ship. But some do circumvent such assignments, either through marriage, travel, or general life experience. Then there are the children who are products of cross-cultural marriages. They get to write a whole new identity all for themselves; to discard that they don’t want, to keep what they do. They get to make brand new puppets. Ibrahim was four years old and attending a preschool in Bahrain when I first asked him what color he was. “Umm, you mean, you aren’t white?” I asked. “No nanna, I’m brwown.” (Yes, he calls his me nanna, because his father used to tell him to go find his nann-id, “your mother,” in Farsi. So my son essentially calls me what is equivalent to “granny” in some languages around the world). Of course he saw himself as brown. He went to school with Arab and Pakistan kids with names, foods, and a families that looked more like his own than those of his blond, British classmates. His cultural experience wasn’t like the other white kids. Ibrahim knows that he is different. “I’m a really complicated person,” is his 10-yr-old way of saying he is transcultured. He has lived and traveled around the world. He spent this past summer in Africa with his father. The interesting thing about being a child conceived between multiple cultures (and I say between, because he is not a product solely of America or Afghanistan; he is a creation of many cultures) is that he understands that he is always bigger than the moment; that there are always another contexts to consider. Some people will spend a lifetime before they learn that one, tiny little lesson. Two years ago, I asked him to list all of his ethnicities, just to see how informed he was of his genetic and cultural profile. He held up both hands and starting counting on his fingers. Ibrahim’s parents are no longer together. His father is abroad doing United Nations work; his mother is raising him as a single Muslim woman and trying to find her place in the world. What she misses most is the nicely shaped cross-cultural box that married provided. Being married to someone from another culture and being Muslim made you Super Othered, and by some accounts, Super Cool. Now, the mother is just a globally-nuanced white woman working a low-wage day job with an interesting son who doesn’t see himself as part of white America. The son knows that he has an Afghan father and a culturally complex American mother. Who do you most identify with, the mother asks? The son looks up at her with his big brown eyes, “Well, pader is from one culture, but you are from, like, many different cultures, so I see myself more like you,” he comments, before he returns doing his very American, very 10 year old Minecraft. Deonna Kelli Sayed is an American-Muslim writer and author of Paranormal Obsession: America’s Fascination with Ghosts & Hauntings, Spooks & Spirits. She is also included in the New York Times featured anthology, Love, InshAllah: The Secret Love Lives of American-Muslim Women. Visit her at deonnakellisayed.com and her blog at deonnakellisayed.wordpress.com to learn more. She is also on Twitter @deonnakelli and Facebook at DeonnakSayed. This entry was posted in Cross-cultural learning moments, Family Challenges, Guest posts, On Islam and Muslims, Visits from the Karagöz puppets and tagged Baku, childhood, children, Deonna Kelli Sayed, muslim, New York Times, Pakistan, United States. Bookmark the permalink. . . so complex and yet so simple! Loved this, a rare insight. She is an master (mistress?) at the complex yet simple in her writings. Thank you for the feedback! If you would like to channel the puppets (or let the puppets channel you) feel free! I am not supposed to write for a month. I am using the dictation software with minimal editing when it gets it wrong with my right hand. Actually, I might reblog your post on visiting the Karagoz museum if that’s ok? I can vouch for the author. She is deeply flattered that you took time to read it! Because this blog and this author is awesome. I couldn’t agree more with Jolly Joker, Deonna, I can vouch for the fact that he’s not joking when he says this! Respect! Deonna– This is a beautiful post and I am fascinated by your charming Ibrahim. He is growing up to be a wise and wonderful person. Today I was editing my 17-year-old half-Italian, half-American son’s essay that he wants to send as part of an application to enter a university program in the UK with a focus on international human rights law. Reading it, I realized his cross-cultural childhood had made him much more aware and sensitive to social injustice around the world. Exposure to different races and cultures does these children a world of good. And my compliments to you, Deonna, as his mother. From my own experience, I know it is harder to raise a child when you have so many more influences to balance– there are many more “sfumature” as they say in Italian (shades of gray) about what is right and wrong, proper and improper, acceptable and unacceptable, good and bad. Thank you for your lovely post. Thanks, Trisha, for this thoughtful response. I was thinking of you a lot as I read Deonna’s lovely essay. I wonder what your kids would say about how they identify themselves? Could make for a good blog post from one of them. Love, Liz. Thanks to everyone for reading and commenting. It meant a lot to me, and it was the first time I’d really shared about my son! It avoids fat from being made and reduces your appetite. affordable looking and it could be slack design may be specified symbol that you are considering a faux Gucci handbags.